Michael F. Holt is recognized as one of the most prominent political historians for America in the nineteenth century. The center of Holt’s historical work is a theme of answering how and why the United States went to war amongst themselves in what became the bloodiest war in American history, the Civil War, by emphasizing the role that politics played in shaping this trajectory. His prominence transpired in the late twentieth century in a period characterized by the New Political History framework. The historians that advanced this notion discredited the former perspective that political development was impacted solely from the national level, or in other words, that national political figures in Washington were the crucial participants that drove the United States to the point of sectional fracture and conflict. In doing so, there was a rise in significance for grass-root movements and voter analysis that advocated the necessity for a shift to placing the center of development on the state and local politics or issues. 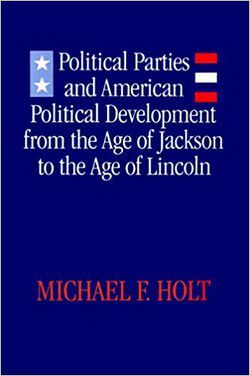 Holt published essays and gave prominent guest lectures that defended and advanced these very tenets to viewing American Political Development, but in 1992 he organized a collection of primarily old, and one new, essays that challenge this innovative form of political history that he once helped create.